BOOK OF HOURS - Leaf on vellum from a printed Book of Hours, with hunting scenes. Title : Leaf on vellum from a printed Book of Hours, with hunting scenes.. Date : Paris, Philippe Pigouchet for Simon Vostre, ca. 1502. Size : 6.1 x 4.0 inches. / 15.5 x 10.2 cm. 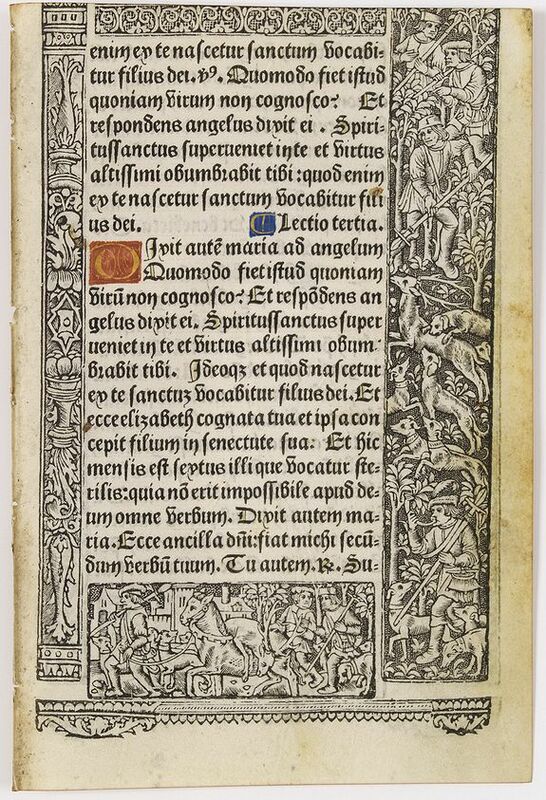 Description :21 Lines of printed text, surrounded by renaissance borders decorated with hunting scenes. In the long series of Pigouchet-Vostre Books of Hours, this edition is apparently the second, following that of 22 May 1496, to be illustrated with Pigouchet's second series of large metalcuts (Fairfax-Murray set 2), larger in size and more finely executed than the rather crude series of cuts used before 1496 (cf. Fairfax Murray French I, 253 and p. 289). Most of the metalcut borders, including Pigouchet's fine Dance of Death suite, were also introduced in 1496. The complete suite of the Dance of Death includes 30 male and 30 female subjects. In later editions the ogival arches or criblé ornamentation separating the scenes in the borders were replaced by typeset text. For eighteen years, the French printer and engraver Philippe Pigouchet (active 1488-1518) and the printer Simon Vostre (active 15th century) worked together to produce hundreds of Books of Hours. Condition : Printed on vellum in black with many initials hand painted in red, blue and gold. Vellum at the edges slightly soiled, as usual. Upper margin cropped into printed area.